In my kitchen I hate to waste anything. Did you know that there is no reason to ever throw away the white tips of your green onions? Nope! 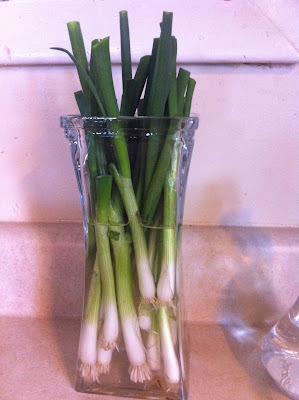 Just stick them in water and keep them in a sunny place and you will have an indefinite supply of fresh green onions! It doesn't get much better (or greener) than this!